The two pounds of fresh, organic, locally-grown figs seemed like a good idea when we bought them. We'd bake some yummy turnovers or maybe a little jam, we thought. But when the temperature skyrocketed over the weekend (peaking at yesterday's 113-degree thermometer–buster), we thought again, as firing up our drafty old oven now seemed like a very bad idea. 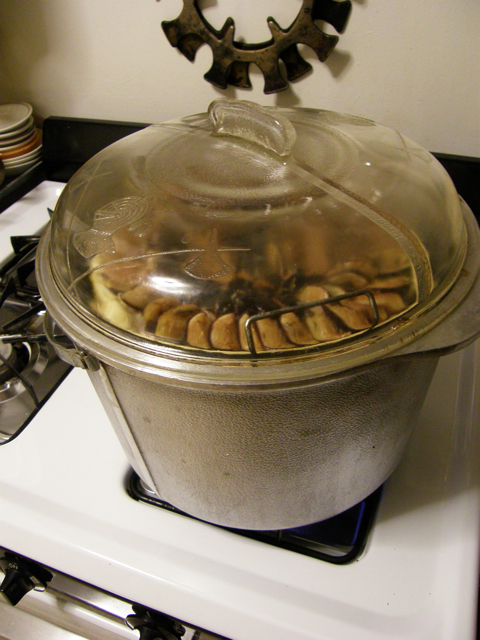 I pulled out the Guardian Service Kettle/Canner and did some stovetop baking instead. I adapted the recipe below from one by Barbara Wilde, whose l'Atelier Vert (Green Studio) is devoted to traditional French home and garden style. It makes a delectable treat—chewy, crispy, flaky and juicy—and the nut filling gives it higher ratios of protein and fiber and lower sugar and fat than your average dessert. If you serve it with yogurt, it's almost healthy. 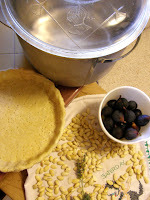 1) Prepare a standard pâte brisée (pie dough) for a 9-10 inch crust. Shape it into a flattened round, wrap in wax paper and refrigerate at least 2 hours. 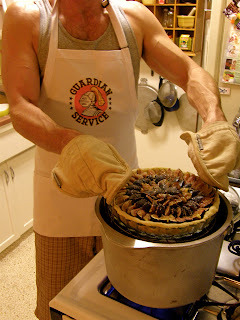 Roll out and line a tart pan, prick all over, and place in freezer for at least half an hour. 2) Preheat Kettle over high heat for 10 minutes. Remove the crust from freezer, line with foil, and fill with dried beans or baking weights. Bake for 15-20 minutes, until the edges turn pale gold. 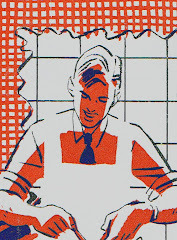 Remove from oven, remove weights and foil, and reserve. 3) In a food processor, grind the almonds with the 1/2 cup of sugar. Add the lavender, egg, and Madeira, pulsing until it forms a paste. Delicately spread the mixture over the prebaked pastry shell. 4) Preheat Kettle over high heat. 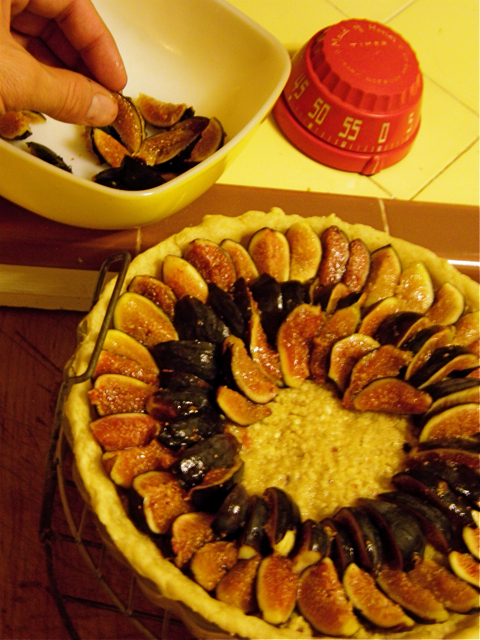 Arrange the fig slices in concentric, slightly overlapping circles. Sprinkle with 2 to 3 Tbsp. lavender sugar. Place tart on top baking rack and carefully lower into Kettle. 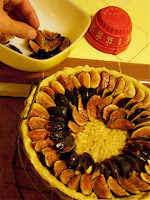 Cover and bake over high heat for 30 minutes or until the figs darken and ooze a bit of juice. Remove tart and rack from the canner and let stand 10 minutes before serving. Optional: drizzle evenly with the warmed lavender honey and serve à la mode.